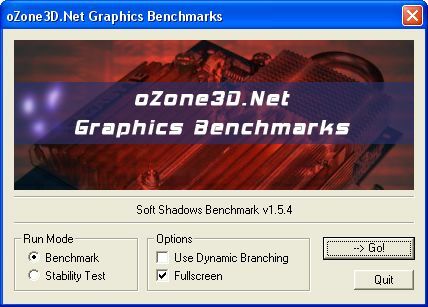 jegx AT ozone3d DOT net and add "[BENCHMARK FEEDBACK]" to the subject. Processor: Pentium 4 or AMD64 and up processor - 2.6 GHz and up. This benchmark is linked to the following tutorial: 3D Pipeline of SM3/DX9 GPUs. This OpenGL benchmark is focused on the pixel processing unit (pixel pipelines). A 3D scene with 5 objects and 3 dynamic lights is rendered. Each object casts soft shadows and the filtering of soft shadows is performed by a 7x7 filter. 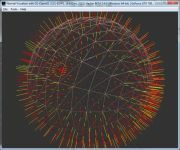 The benchmark exploits the latest 3D features like the vertex buffer objects (VBO), the framebuffer objects (FBO) and a GL 2.0 codepath. This benchmark is based on an experimental branch of the oZone3D engine (v3.x). The filtering of the shadow edges is the biggest difficulty of soft shadows and it is a very GPU power consuming task. So this benchmark can be used to quickly know the performances in OpenGL 2.0 of the new graphics cards generation. Besides, the benchmark has two modes of running: with and without dynamic branching in the pixel shader. The mode with dynamic branching is new and allows to see the impact of this fundamental functionality of the shader model 3.0. Benchmark: starts the benchmark in performance measure mode. It is the default mode. Stability Test: starts the benchmark in stability test mode. This mode is useful to test your graphics card during your overcloking sessions. In this mode, the 3D scene is rendered until the user presses the [ESC] key. The o3Mark score is simple: it is the number of frames that have been displayed during the benchmark. So the higher the score, the more powerful the graphics card. In order to exploit the SLI or Crossfire systems, the benchmark runs in fullscreen mode with a resolution of 1280x1024 / 32 bits. Use Dynamic Branching: enables the dynamic branching in the pixels shaders. Fullscreen: starts the benchmark in fullscreen mode. In Benchmark Mode, the Fullscreen option is automatically selected. Due to the large number of texture lookup in the pixel shaders, the Soft Shadows Benchmark requires at least a GeFORCE 6*** and higher or a Radeon X1*** and higher. The filtering of the shadow edges uses a 7x7 convolution kernel (see the following tutorial for further information on convolution kernels: Image Filtering). The convolution kernel parameters are passed to the pixel shader via the GLSL uniform arrays. Currently, this version works fine on nVidia Geforce 6*** and 7*** and on ATI X1*** graphics controllers. Some old graphic controllers based on the Radeon R300 or R400 GPU (like the X700 for example) can not execute this benchmark because this kind of GPU supports only 32 texture fetches per pixel shader. The benchmark needs at least 49 texture fetches. The soft shadows module uses a 2048x2048 / 24 bits depth map. This depth map (or shadow map) is attached to a framebuffer object (FBO) for the render to texture (RTT). Since ATI's GPUs do not support linear filtering of depth maps, only a nearest filtering is performed on depth map. The meshes use the vertex buffer objects (VBO) to speed up the rendering. 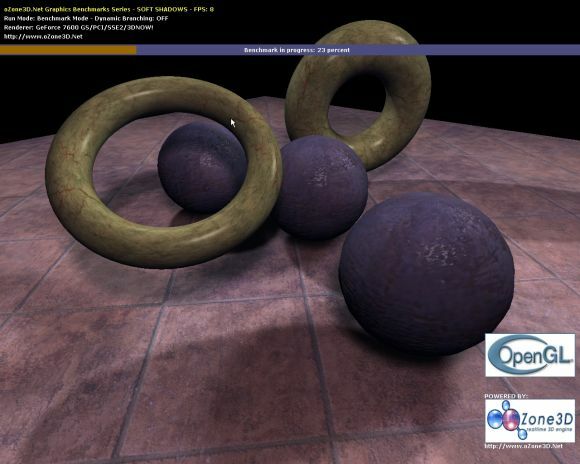 The gpu-shaders codepath uses the new GLSL API of OpenGL 2.0. The new oZone3D engine does not use anymore the old ARB functions of the OpenGL Shading Language API. This table is updated regularly with scores found in the forums over the web. 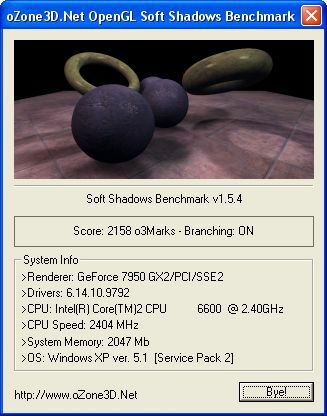 You can also post your result in the following thread: [OpenGL Benchmark] Soft Shadows. Bugfix: the startup and result dialog boxes display problem is fixed. The problem came from the XP style used. Thanks to TuKo from www.swissclockers.ch for his tests. Bugfix: now graphics memory is correctly freed at the end of the benchmark. You can launch several intances of the benchmark and keep open all score dialog boxes in order to compare the results. Thanks to www.pcgameshardware.de. Feature: Display of system information in the score dialog box. Feature: Added a startup dialog box in order to select the options (benchmark or stability test modes, fullscreen or windowed mode, enabling or disabling dynamic branching). Page generated in 0.0033159255981445 seconds.